Microsoft SQL Server 2012 is the one of the latest versions of Microsoft SQL Server, the extremely popular and widely used database system in the world. Simplilearn’s Implementing a Data Warehouse with SQL Server 2012 course introduces you to the key components of a data warehousing solution. The course provides learners with the technical skills required to design and implement a data warehouse. It also provides information on automating an ETL solution using SQL Server Integration Services. This course will help current and aspiring data professionals to prepare for exam 70-463, known as Implementing a Data Warehouse with SQL Server 2012. The course will help you understand the implementation of data warehouse with SQL Server 2012. You will learn to design and implement a data warehouse. You will see how to install SSIS, create dimensions, add tasks to control flow, explore attributes and hierarchies, and so on. Simplilearn’s training breaks up the course material into 10 easy-to-follow modules that cover the course-level objectives. Further, demos are provided for all the major concepts covered in a lesson so that participants understand how the steps learned are implemented in real time. Passing the Implementing a Data Warehouse with SQL Server 2012 (70-463) exam is a requirement to getting MCSA certified, which in turn is a prerequisite to achieving an MCSE certification. In high-growth industries, entry-level employees with a Microsoft Certified Solutions Associate (MCSA) certification can annually earn up to $16,000 more than their non-certified peers. Better job opportunities also await them. What are the eligibility requirements to take the 70-463 exam? There are no eligibility requirements to take up this course. Register at the Microsoft website and select your exam to schedule with Pearson VUE. This exam is targeted at database professionals whose primary duties involve installation, configuration, and maintenance tasks. Why is this exam popular? SQL Server 2012 is a powerful platform that is widely used in the enterprise and cloud. Many critical systems are based on it. Exam 70-463 is part of a series of certifications that can make you a master of this platform. Simplilearnâ€™s training was explained in a structured manner which made it easy to grasp. I am very pleased with the training provided by Simplilearn. Thank you for the help. 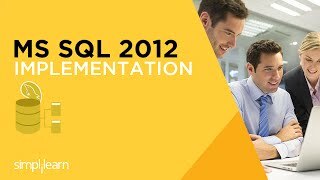 This course from Simplilearn has been a great help for a professional like me as it covers a spectrum of topics in MS SQL and prepares for a better understanding of SQL server which comes in handy in future.